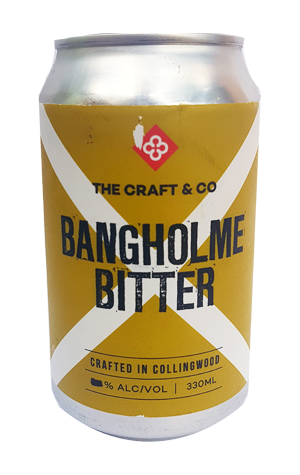 The Craft & Co may brew in the heart of Collingwood, but the owners also have a second home in Melbourne’s southeastern suburb Bangholme. Bangholme Bitter was brewed with that second venue, The Farm, in mind and with the intention of having an accessible beer for those calling into the 40-acre winery, café and cellar door. While the beer might be accessible, and is in many ways an ode to the traditional British style, it packs no shortage of flavour. Sweet biscuit and toffee dominate on the malt front and the beer finishes clean with a building bitterness, while there's something of a modern twist on the style thanks to the addition of American Amarillo hops, adding a hint of a mandarin alongside the beer's slighty spicy finish.